How to Make Basic Great Chocolate Chip Cookies - YoursTrulyHandmade.com - DIY, Home Rennovations and a lot of crafts! I recently got a sunny yellow background for photos and Iâ€™ve been playing around with it â€“ something about yellow makes me absurdly happy. Which is funny because Mike has a yellow car, but Iâ€™ve been after him to paint it white.Â People are always waving us down while weâ€™re in it; they think weâ€™re a taxi even though our car looks nothing like a taxi. But thatâ€™s not the real reason I want him to paint it. Itâ€™s because bugs are absurdly attracted to what appears to them to be a giant yellow flower. I have fear of insects. I always say Iâ€™ll get over it and be a real grown up, but so far, no dice. Yellow cars and bugs aside, here are some chocolate chip cookies. I, like everyone else on this planet, am obsessed with them. 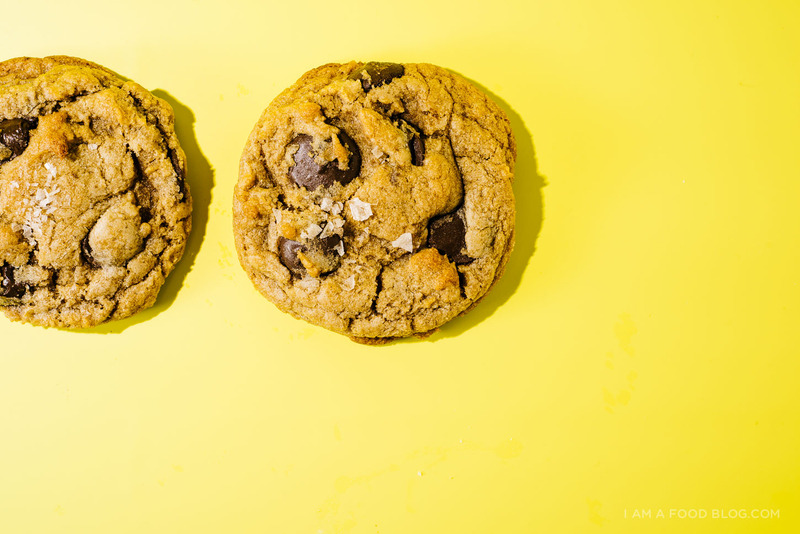 Theyâ€™re one of the first things I ever made (and failed at)Â so I know how daunting it can be to make the perfect chocolate chip cookie. 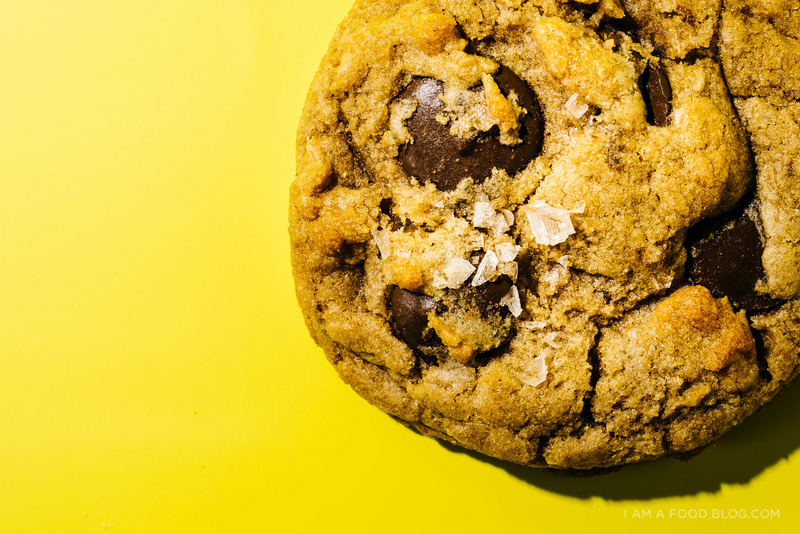 First off though, we have to agree on what the perfect chocolate chip cookie is. Is it thick and chewy? Thin and crispy? Does it have a warm brown sugar flavor or more of aÂ vanilla scented white sugar? Butter or shortening? 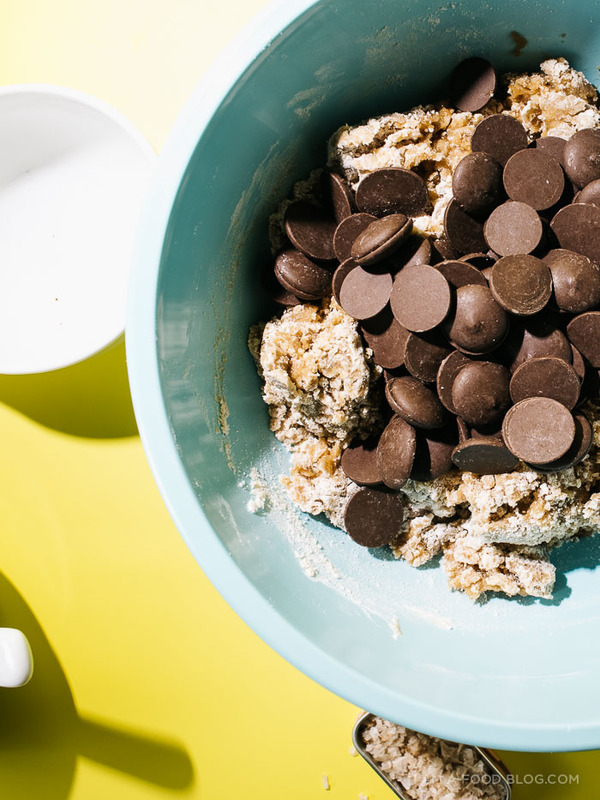 Chocolate chips, chocolate chunks, or straight up chopped up chocolate? There are so many, many chocolate cookie recipes out there that itâ€™s hard to figure out which one you should go for. 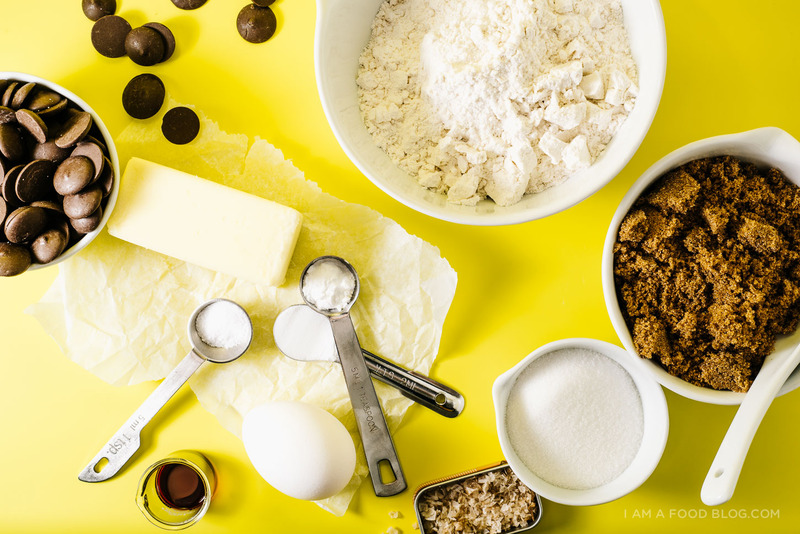 At the heart of it, chocolate chip cookies are just: butter, sugar(s), eggs, vanilla, flour, baking soda, salt, and chocolate. Itâ€™s funny how those simple ingredients can come together in so many different ways. These cookies, found in the lovelyÂ Tara Oâ€™Bradyâ€™s book, Seven Spoons, are lush and thick with plenty of chew. 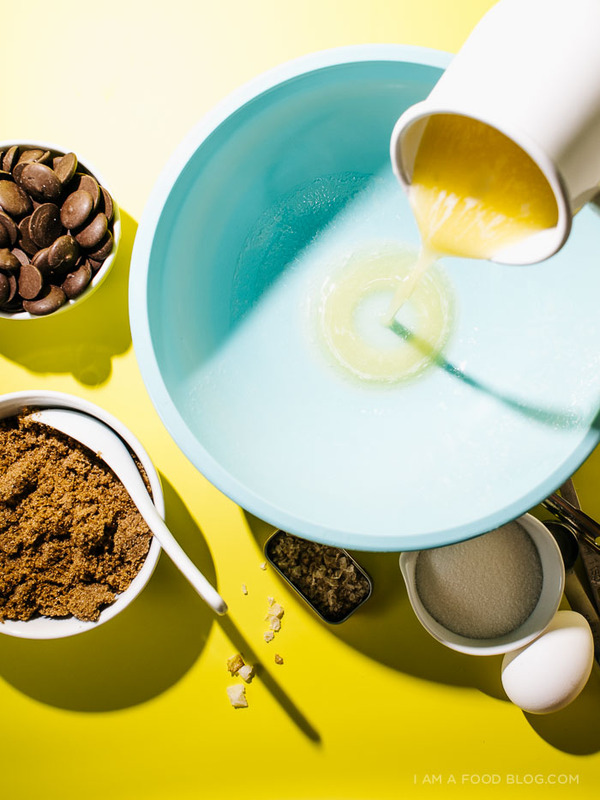 They come together very easily and bonus: you donâ€™t need to wait for your butter to come to room temperature â€“ instead itâ€™s melted before mixing with the sugar. After the melted butter and sugars are mixed together, eggs are mixed in, one at a time. Vanilla is added and then you mix in the flour (which you would have previously whisked with the baking soda, powder, and salt). This is the point in which I think a lot of potential cookie mistakes happen. Instructions generally say to mix until just combined. 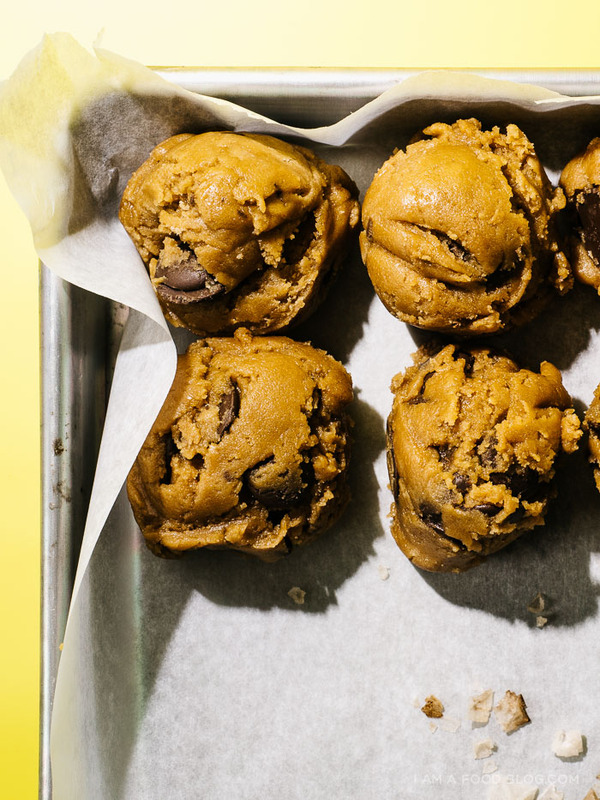 Which is great if youâ€™ve made a ton of batches of cookies in your life. But if you havenâ€™t, itâ€™s kind of hard to surmise what â€œjust combinedâ€ means. Personally, I like to mix until most of the flour clumps are gone, but the dough is still dusty looking, a la the picture on the left. At that point, I add in the chocolate and mix some more until everything has just lost the dusty sheen. 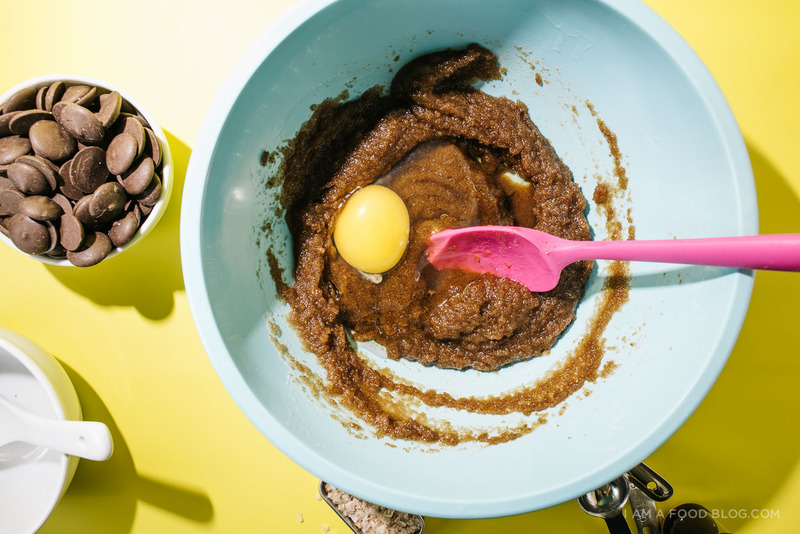 Over-mixing makes cookies tough and no one likes a tough cookie. I wish you only soft and chewy cookiesâ€¦unless you like the crispy ones. In that case, I wish you crispy cookiesâ€¦really, I just want cookie happiness for everyone! Preheat the oven to 360Â°F. 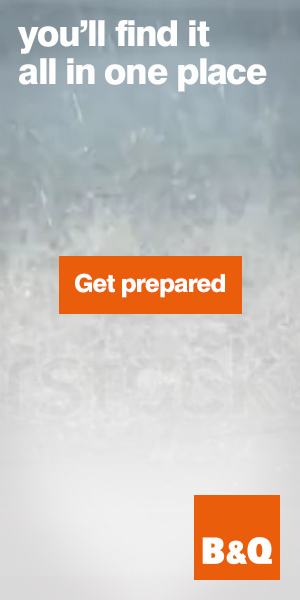 Line 2 rimmed baking sheets with parchment paper. Melt the butter in a heavy bottomed saucepan over the lowest heat possible, stirring occasionally. 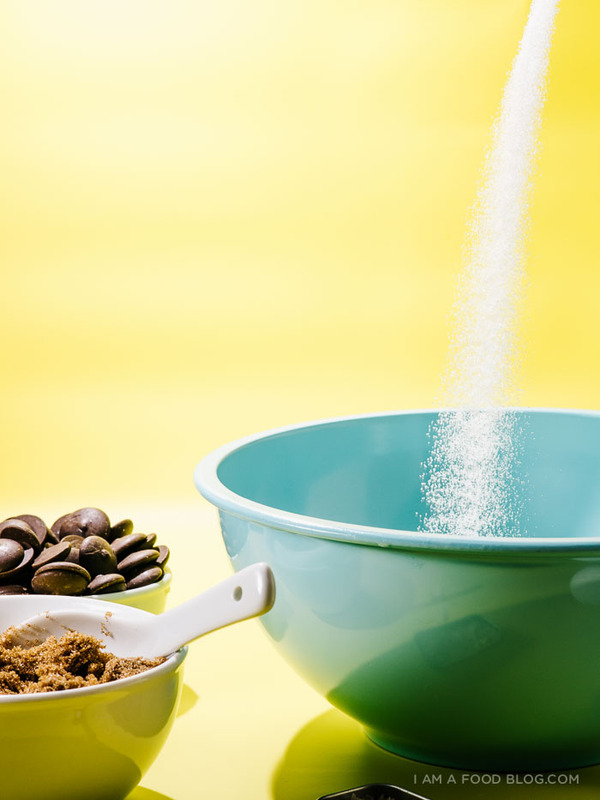 In a bowl, whisk together the flour, baking powder, baking soda, and salt. Set aside. Pour the melted butter into a large bowl and whisk in the sugars. Add the eggs, one at a time, whisking until just combined. Stir in the vanilla. Use a wooden spoon or silicone spatula to stir in the dry ingredients until barely blended. Stir in the chocolate. Refrigerate for 5 minutes then roll into 3 tablespoon balls and arrange on the prepared pans, leaving 3 inches between each cookie. Sprinkle with sea salt and bake until the tops are cracked and lightly golden, 10-12 minutes, rotating the pan halfway through. Cool on the pan for 2 minutes, the move to a wire rack to cool completely.